San Fernando High School is one of the oldest and largest comprehensive public high schools in the Los Angeles Unified School District. Photo by Olivia Herstein. 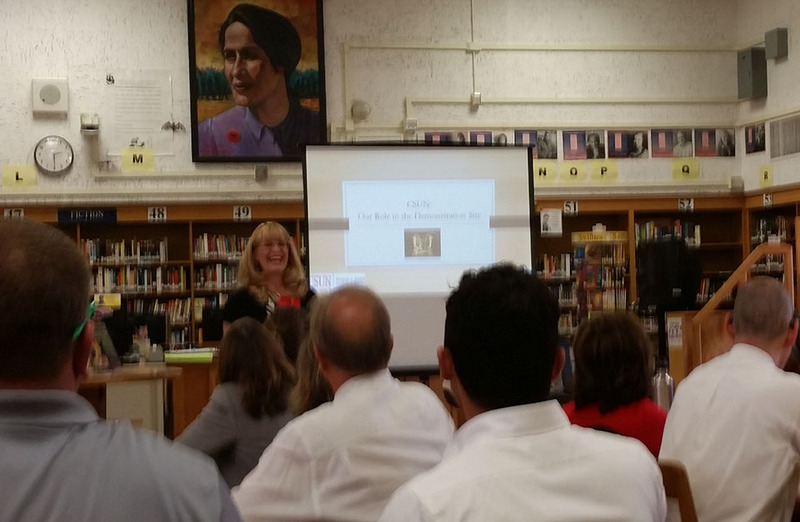 Wendy Murawski, executive director and Eisner endowed chair of CSUN's Center for Teaching and Learning, presents to San Fernando High School faculty on Sept. 19, 2017, at the rollout of a new CSUN demonstration site for expanded teacher training, college counseling and parent workshops. Murawski presented in the SFHS library, as a portrait of civil rights activist Dolores Huerta looked on. Photo by Olivia Herstein. 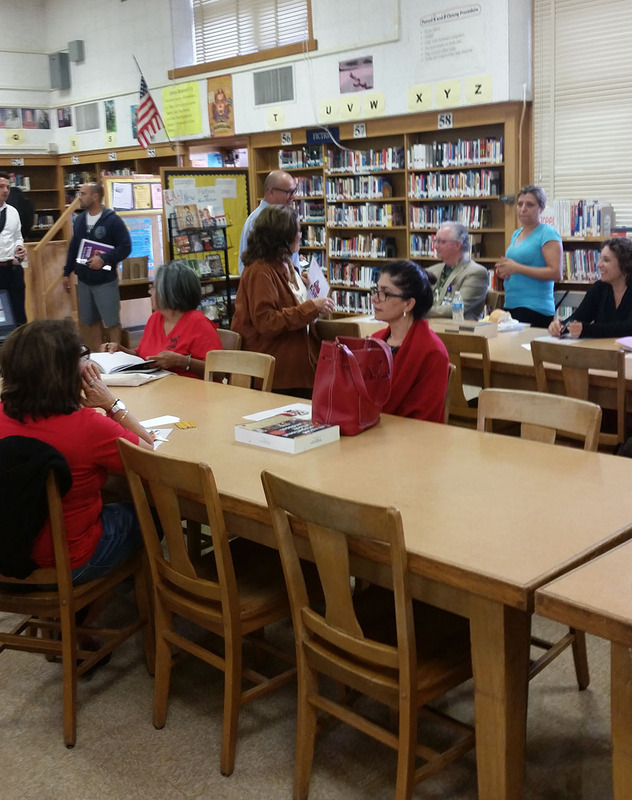 On Sept. 19, 2017, San Fernando High School faculty prepare with CSUN faculty for the rollout of a new CSUN Center for Teaching and Learning demonstration site for expanded teacher training, college counseling and parent workshops. Photo by Olivia Herstein. 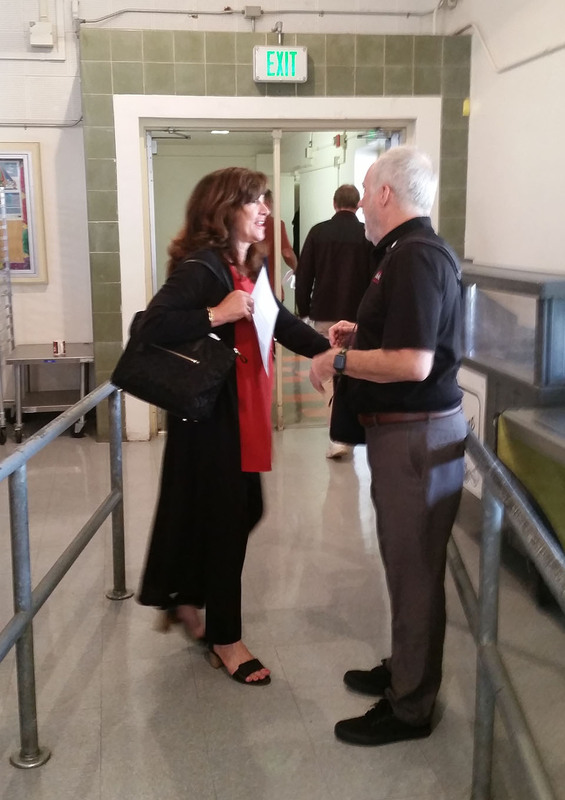 Shari Tarver-Behring, interim dean of CSUN's Michael D. Eisner College of Education, greets Project GRAD Los Angeles President and CEO Ford Roosevelt, Sept. 19, 2017, at the rollout of a new CSUN demonstration site for expanded teacher training, college counseling and parent workshops at San Fernando High School. Photo by Olivia Herstein. California State University, Northridge, a longtime leader in preparing K-12 teachers and administrators, is not new to the fight to boost college readiness and accessibility for Los Angeles teenagers. This fall, CSUN faculty and their community partners are taking the fight to a local school. As their proving ground, the professors and leaders selected San Fernando High School, one of the largest comprehensive public high schools in the Los Angeles Unified School District, as a demonstration site for expanded teacher training, college counseling and parent workshops. The effort is a partnership between CSUN’s Michael D. Eisner College of Education, San Fernando High leadership and Project GRAD Los Angeles, a locally based nonprofit that works to foster greater education equity. The three entities have a long, successful history of collaboration dating back to 1999, when Project GRAD first partnered with San Fernando High School. Most recently, the three were instrumental in launching the Transition to College Math and Statistics program, which addresses college math remediation and was developed by Katherine Stevenson, math professor and director of Developmental Mathematics at CSUN. 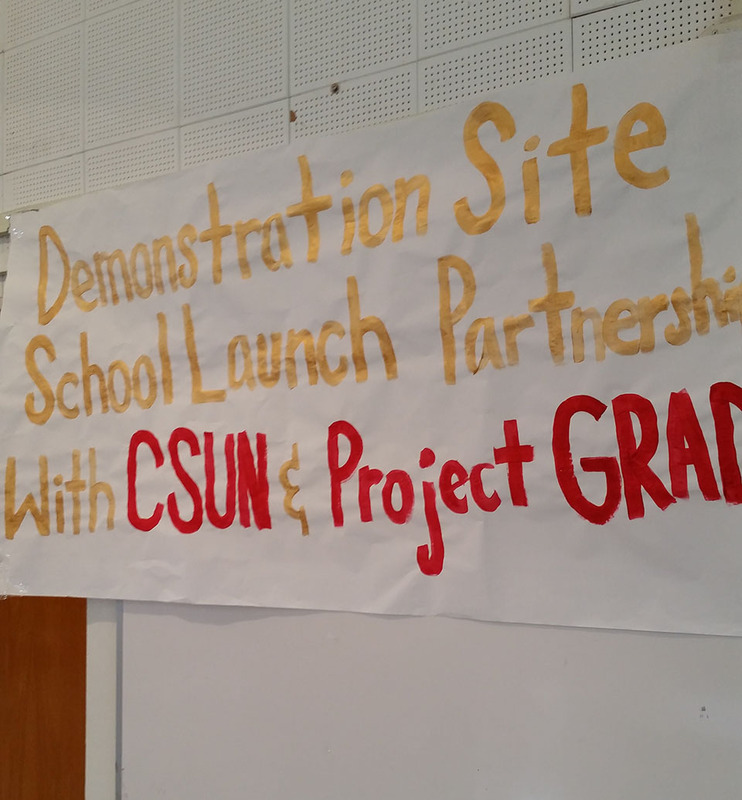 The demonstration site collaboration is the largest ever attempted between a university and high school in the Los Angeles Unified School District (LAUSD). CSUN leaders said they picked San Fernando High School to show what’s possible at a large, diverse public high school — in hopes that LAUSD and other districts will replicate the model. It certainly didn’t hurt that many San Fernando faculty and staff were CSUN education alumni — including Principal Flora Mendoza-Werner. On Sept. 19, more than a dozen CSUN faculty, Project GRAD’s entire staff of 24 advisors and administrators, and more than 100 San Fernando teachers met to celebrate the partnership’s rollout, with presentations and networking. The event felt like a big reunion, as Matador alumni — now San Fernando administrators and department chairs — reunited with their own teachers, from college and even childhood days. “The seed for this partnership idea was planted many years ago,” said Mendoza-Werner ’00 (Teaching Credential). “Now we actually get to have this amazing partnership with this institution, CSUN, where most of the teachers in the San Fernando Valley get their teaching credential. Cheng ’00 (M.A., Secondary Education), a San Fernando alumnus, is now an associate professor of secondary education at CSUN. Buck ’73 (Teaching Credential) started as a student teacher at San Fernando in 1972 and stayed in the community, teaching and serving as principal at Maclay (now a middle school). He works as a consultant for CSUN’s Center for Teaching and Learning. “It’s not just your students who come to Cal State Northridge, but so many of you are Matadors as well,” Wendy Murawski, executive director and Eisner Endowed Chair of the Center for Teaching and Learning, told the high school faculty at the kickoff. “So we feel like there’s a natural collaboration. Key professional development topics for teachers will include academic discourse, and best practices for instructing English-language learners and students with special needs. Eisner College faculty envision a three-year timeline for this project, and they hope with funding to expand it, Murawski said. 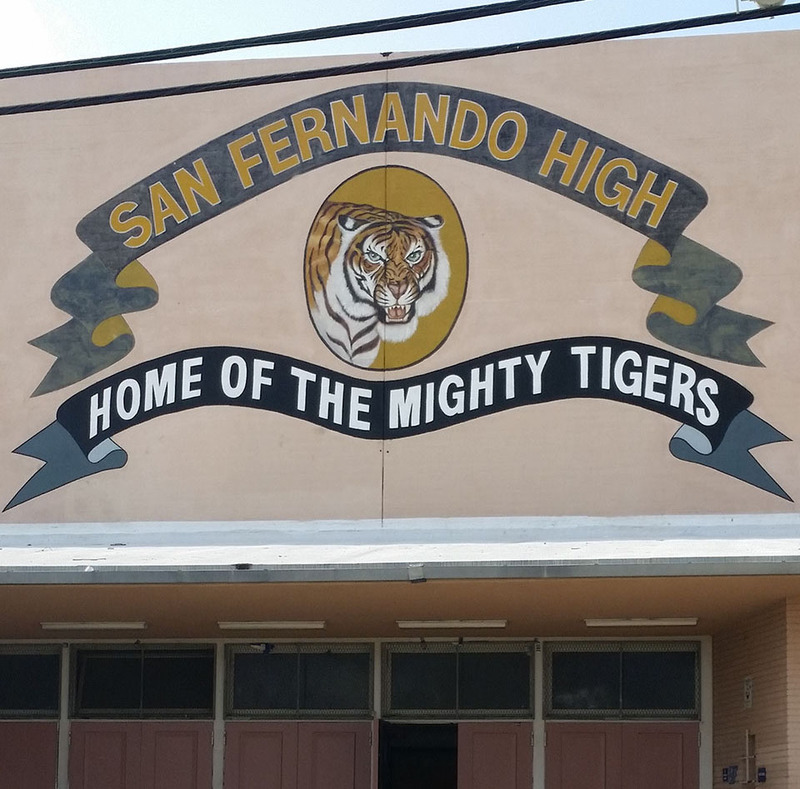 Established in 1896, San Fernando is one of the oldest high schools in the LA area. With about 2,000 students, it’s a Title I school, which means more than half the student population is low-income, making the school eligible for additional federal funding. “Many San Fernando High School graduates are or will be first-generation [college students],” Mendoza-Werner said. “So, this partnership with CSUN and Project GRAD will address three significant barriers to successful post-secondary education: One is academic preparation — ensuring students enter post-secondary work academically prepared and ready for regular coursework. Two: complexity, which means deepening the level of help extended to students and families in order to navigate the application process. And three: affordability, which refers to expanding assistance and resources to students and families. The CSUN-Project GRAD partnership aims to build a two-way pipeline — between high school teachers and university professors — to help create a “college-going culture for all LA high school students,” said Project GRAD Los Angeles President and CEO Ford Roosevelt. Project GRAD provides college advising on site at the high school, “college experience” visits to campuses (including CSUN) and transcript and application analysis for ninth through 11th graders, among other support. “Often, the students are trying to figure out how to talk to their families about college,” said Natalie Frausto, a site manager at San Fernando who runs family outreach for Project GRAD. Shari Tarver-Behring, interim dean of the Eisner College, was on hand to help kick off the San Fernando High partnership, along with Dwayne Cantrell, CSUN associate vice president for student services. Cantrell will help direct tutoring and other volunteering opportunities for CSUN undergraduates at San Fernando. For more information about CSUN’s Center for Teaching and Learning, visit http://www.csun.edu/center-teaching-learning.